Military officials have submitted their reports on “don’t ask, don’t tell” repeal certification, one week after the U.S. Court of Appeals for the Ninth Circuit ruled in a longstanding case that the Department of Defense can no longer enforce the policy barring openly gay service members. The assessments will be reviewed by Secretary of Defense Leon Panetta and Chairman of the Joint Chiefs of Staff Adm. Mike Mullen. 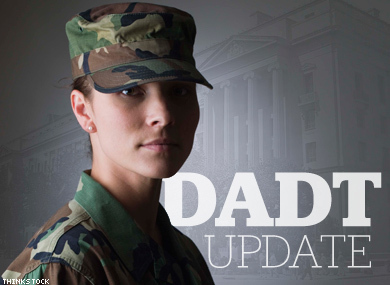 President Obama asserted two weeks ago at an LGBT Pride Month reception at the White House that certification of DADT repeal will be completed in “weeks, not months.” The contents of the assessment reports have not yet been made public. Last week a three-judge panel of the Ninth Circuit ordered that a stay on U.S. district judge Virginia Phillips’s October injunction against DADT in a case brought by the Log Cabin Republicans be lifted (Phillips ruled the policy unconstitutional). The Justice Department has not appealed the ruling, prompting a Monday court order that DOJ advise Congress should it decline to further defend the policy in the suit. Log Cabin attorneys have said they will not drop the case, citing ongoing concerns for openly gay service members. Oral arguments in the case before the Ninth Circuit are scheduled for the week of August 29. Following the Ninth Circuit's order, the Defense Department confirmed Friday that “don’t ask, don’t tell” investigations had been suspended and that new enlistments would be accepted “without regard to sexual orientation.” One gay service member, Airman 1st Class Justin Dailey, confirmed to The Advocate last week that his discharge proceedings under DADT had been suspended. The process that Congress and the President established as a prerequisite to the repeal of the "Don't Ask, Don't Tell" policy is well underway. Today DoD confirmed that the service secretaries, service chiefs and combatant commanders have submitted their assessments. These assessments represent their best judgment, providing their recommendations, insight, concerns (if any) and advice regarding the status of their service's preparation for repeal. The Secretary and Chairman will review the assessments. At SLDN, we are encouraged by the delivery of these assessments and recommendations on repeal of ‘Don’t Ask, Don’t Tell’ to Secretary Panetta and Chairman Mullen. To end the confusion among troops and in the courts, we need the formal certification from the President, Secretary Panetta, and Admiral Mullen, and that document should go up to Capitol Hill and to the Court of Appeals for the Ninth Circuit within days. Senior military leaders have already said the process is working without significant disruption and we urge the Chairman and Secretary to certify repeal as soon as possible so that we can finally rid our laws of this policy that contradicts both our values and our security interests.